Well, I really had to search my old Chinese wedding chest for proofs concerning a 4 week trip of all Egypt in the 80s of the last century. Fortunately all photos still existing after more than 30 years of storage and now somehow also antique. So welcome back to the world of simplest analog photography which I find indeed more touching than all these bits and bytes of today. It is real paper and memory to be felt, rather oldfashioned these days I know. The Oriental world has played an important part in my life, and this trip to Egypt in 1985 was my first encounter with this fascinating cosmos. The visit of Abu Simbel in the very Southern part of Egypt near the Sudanese border was truly a real highlight in this regard because the archeological site is a quite remote place in the Nubian desert at the shores of Lake Nasser. 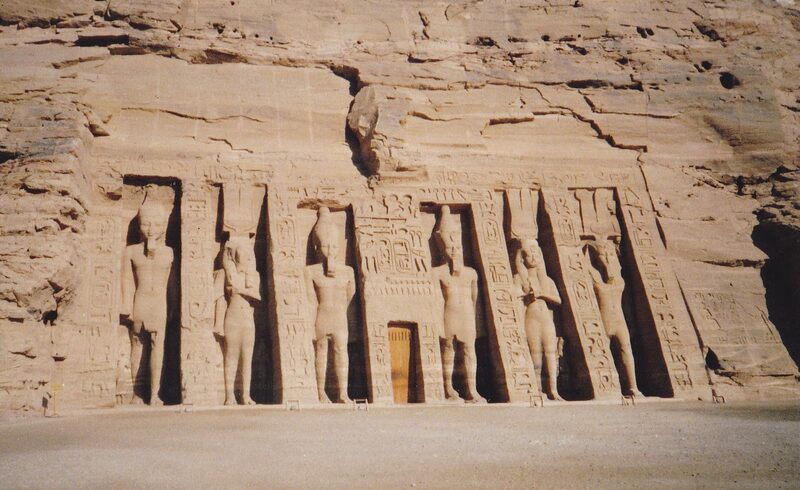 To visit the location was quite easy while diverse agencies in the big city of Aswan offer daily trips to Abu Simbel. We were leaving Aswan at around 4 a.m. very early (due to the high temperatures) and driving with some kind of jeep or SUV first on a road later on a good sandy piste. Camel caravans from Sudan passed our way on their way to the camel markets of Luxor and/or Cairo, food for the many Egyptians living in the valley of the Nile. The trip from Aswan to Abu Simbel takes about 3 hours, so we arrived shortly before the sun was rising above Lake Nasser. The sun is still very strong and dazzling even in October, so the temperatures increase rapidly. With the first sunrays of the day I was able to make some photos of this spectacular place constructed by the ancient Pharaonic kingdom of Egyot. At this place in the wide desert you already get a good feeling of vast Africa stretching further thousands of miles to the South. (1) This graphic being published under the GNU Free Documentation License. (2) The national emblem of Egypt is Saladin’s famous eagle – also on its flag. It must have been quite a thrill to discover these old photos in the wedding chest! Looking forward to view more of them. To be honest, I had simply forgotten the photos but actually in the course of Spring tidying up a little bit finding this and that. Lateron this year more to follow. Have a nice day! Just this additional Information, features about my trip to Egypt will appear on a monthly basis in my blog till end of the year. So 5 posts still outstanding and mostly already prepared. In this regard I have noticed that the old analog photos are much more touching and real for me, all this digital stuff is nice and also very practical but something is missing, I can’t help. So next year I will most probably start publishing some of my international mail-art from the 80s and early 90s, this was the analog way of blogging around the world these days, it also worked fine thru the international postal services and surprises at the letter-box always guaranteed. Have we made any real progress in the last 30 or 40 years? I doubt this quite often. Take care and enjoy the summer! Thank you so much, now to be a bird and cross the Mediterranean to Africa would be quite nice. Ciao. I was not familiar with your use of the word “Oriental”. I researched the word. Egypt is not part of the traditional (or modern) definition of “Oriental”. The Orient was considered anything east of Europe including the Middle East, the Far East and Asia. Egypt and Sudan are in Africa. Egypt is just south of Italy, Spain and Greece. Why are you telling me all this? I know that Egypt is in Africa, it is also mentioned in my last sentence. Furthermore, I use the term orient in a poetical sense, for the Arabic world and much more. Poetry does not need a dictionary and is free in its use. I so agree with you when you say that “analog photography is more touching than all these bits and bytes of today”. Today we click tonnes and dozens of pictures and we have several pictures of one thing to select the best one. The saddest part is we hardly ever go and take a look. There is no novelty in photographs anymore, its so easy. Maybe that’s why its losing its charm too. I have only made 48 photos in 4 weeks in Egypt, that makes the difference. But digital photography also can be used in a creative way. It always depends on the individual person and its use of it. But more important are the pictures in our mind.